My PB2 Thai sauce obsession continues…and this time it’s in this super easy Slow Cooker Thai Peanut Chicken dish. Ever since I used PB2 (affiliate link) to make Thai peanut sauce for Thai Chicken Skewers and then for Thai Chicken Pizza, I’ve been keeping my eyes peeled for more chances to use it again. I found this slow cooker recipe, make a few more tweaks and knew it was the perfect opportunity. This recipe is one of those fast and easy ones where you can just mix everything together and toss it in the slow cooker . When it’s cooked you simply shred it (it’ll basically just fall apart when you touch it with a fork) and serve it however you like. I sautéed some broccoli slaw in a skillet and layered it in a couple lettuce leaves with the chicken on top to make lettuce wraps and it was a really easy, tasty and low cal/low carb meal, but there are tons of alternate serving options. Serve it over rice or vegetables, use it to make pizza or quesadillas, stuff it in a baked sweet potato…the possibilities are endless! How will you serve it? Lay the chicken breasts in a single layer at the bottom of your slow cooker . In a large bowl, combine the PB2 and water and stir until creamy. Add the remainder of the ingredients and stir until well combined. Pour the sauce over the chicken in the slow cooker to cover the chicken. Cook on low for 5-6 hours until chicken is cooked through and shreds easily. Remove the chicken to a plate or cutting board and shred with two forks (it should fall right apart). Put the shredded chicken back into the slow cooker and stir into the sauce. Continue to cook on low for another 5-10 minutes without the lid and then serve. Feel free to sprinkle a pinch more crushed red pepper flakes on yours if you’d like some heat. Made this for dinner today….I just added a little lime juice and served with sticky rice. It’s awesome! Glad you liked it!! Lime juice is a great addition. This looks amazing! Would it be possible to substitute regular peanut butter for the PB2? Definitely! Just omit the water. Obviously this will also change the nutrition info, but it should still be tasty! In case you’re interested Lana, I just made the recipe with chunky peanut butter, and it was AWESOME! It’s fun getting little crunches of peanuts in there! I made this for dinner today. I proceeded to forget to turn on the crockpot. OH YUM! This sounds like my ideal recipe — can’t wait to try! Weirdly enough, I’m allergic to oranges. Can you recommend a substitution for the OJ and marmalade? Thanks — love your site! Hm…maybe use lemonade or pineapple juice instead of the OJ? Any kind of jelly should work. It will change the flavor but might be a yummy twist! Can almond milk be used instead of coconut milk? Thank you! I used unsweetened vanilla almond milk instead of coconut milk. turned out delicious! I am making this tonight, so excited!!! Outstanding! Served this in crisp iceberg lettuce wraps with brown rice on the side.Made a slaw of carrots and purple cabbage and drizzled seasoned rice wine vinegar over it. Cooked the chicken for 6 hrs. and it broke apart beautifully. Mild flavor. Thanks for another winner Emily! Made this tonight for lunches for the week, and had to throw the whole thing in the fridge still hot because I was eating it straight from the tupperware as it cooled! So tasty! 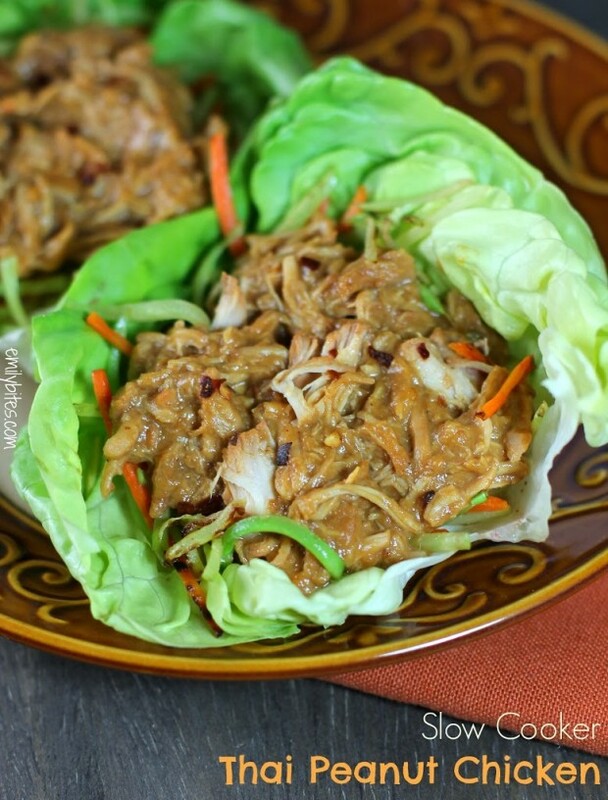 Can’t wait to have mini thai chicken tacos for lunch this week! Also, I would highly recommend throwing in a tablespoon or two of Thai red curry paste (in addition to or in lieu of the pepper flakes, depending on how much you add) for a kick – it was pretty awesome! What is PB2 and where can I get it? PB2 is a powdered peanut butter that you reconstitute with water. They have it at our local Kroger’s in the natural food section with the almond butters and fancy peanut butters. It’s about 4.50. It is extremely delicious, weirdly enough. Do you think almond butter could be a substitute for pb2? I couldn’t find PB2 (yet – I’m on a crazy search for it), but went ahead and made with regular peanut butter. Its sitting home waiting for me to have for dinner tonight – smelled delicious. Wondering what the change to WW +points would be with 3/4 C of regular peanut butter….I’m almost scared to ask. For every 2 TBSP of PB2 there is about 140 more calories in the equivalent Peanut Butter. That means there would be approx. 540 more calories for the entire dish with Peanut butter. I found my PB2 on Amazon. I found it at Festival foods. I bought mine at WalMart. It was the section with the rest of the Peanut Butters and it was about $4 if I remember correctly. I have loved every single recipe from this site, but for some reason I was shocked that I, nor my family liked this dish. This is a very popular dish, so I was surprised. I think it was the orange juice and/or orange marmalade that I didn’t care for the flavor of, to me it overwhelmed the dish. I would be interested to try it again sometime without those ingredients. Just made this yesterday. Holy Yum. This recipe is a keeper! Thank You, Emily! We can’t get PB2 in the UK and they won’t ship it !! (Booooooooo!!) How would you suggest using peanut butter smooth – instead please ?? I searched for hoisin sauce for ever and I finally found. So now I’ve got this in the crock pot now. It smells heavenly! I’ll be serving it with Trader Joe’s brown rice and lettuce leaves. Thanks for another hit! This looks insanely delicious! Any idea whether it could be cooked on high in the slow cooker, and if so, how long would you recommend? I forgot the hoison sauce 🙁 is there a substitute I could use. Really enjoyed this! Next time going to serve it with zucchini noodles! Looking forward to making this! Can you explain the trop 50 though?